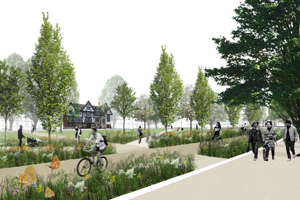 Brighton & Hove City Council has awarded the contract for phases 1 & 2 of the Valley Gardens project to Dyer and Butler Ltd.
Dyer & Butler, part of MGroup Services, has a national profile and a successful track record of managing major infrastructure projects including significant transport and public realm developments. They were selected as the preferred bidder after a tender process which ran from March until June 2018. It was a restricted tender process open only to the ten contractors identified on the GEN3-2 Framework, which was developed by Hampshire County Council and is open to local authorities in the south. The GEN3-2 framework covers specialist civil engineering structural works, complex highway infrastructure work, public authority civil engineering works and associated medium value construction work. Valley Gardens is the name given to the area that runs from St Peter’s Church down to the Palace Pier roundabout. Phases 1 & 2 of the Valley Gardens project area focuses on the green spaces and the surrounding roads and footways from St Peter’s Church to the Old Steine. The construction of phases 1 & 2 of the project is due to start in September, once the final details have been agreed, and the work is expected to take around two years. The aim of the Valley Gardens project is to realise the full potential of the area and make it a more attractive and purposeful city amenity. This will be done by simplifying the existing highway network, making the journey through less complicated and easier for all users, including improving cycle and pedestrian networks. The changes will also ensure better safety for transport users and result in better air quality in the area. Simplifying and improving the transport network will create an opportunity to reclaim some of the green area and enhance its value as a public space. New paths will be created across the public spaces making it a much nicer place to walk through. Most central park spaces will remain lawned areas for general use and a significant number of new trees will be planted, some of which will be new Elms to protect the city’s Elm heritage into the future. The total agreed funding available for the first two phases of the project is £10.126m. The government has made £8m available through the Local Enterprise Partnership. The remaining funding is proposed from local developer contributions and through the Local Transport Plan. . Chair of the Environment, Transport and Sustainability Committee, Councillor Gill Mitchell, said: “This is a significant moment in the Valley Gardens project. I am pleased that Dyer & Butler have been awarded the contract and we can look forward to construction getting underway in the near future. “The aim of the project is to simplify the transport network in the area, making it easier for local residents and visitors to the city to get around. The area’s green spaces will also be improved, making it a much more appealing environment to be enjoyed by local residents and visitors. For more information about the Valley Gardens project, go to www.brighton-hove.gov.uk/valleygardens.